I take absolutely no credit for the creation of this recipe. I have never heard of anyone eating it before (or seen it on a menu, so please feel free to tell me if you have). The idea was all my kids'. We often buy hearty whole grain sour dough bread and sharp cheddar cheese at the farmers' market which we use to make, among other things, paninis. Sometimes we'll add a slice of heirloom tomato or avocado to jazz them up, but last weekend Kenya asked if we could just use pickles. Pickles. Not as a garnish to accompany the tomato and avocado, mind you, but as the sole co-star to the cheese. It sounded so silly that we all (even Kenya) started giggling, "grilled cheese and pickle?" But then Chloe started chanting for it too. Never one to ignore a culinary request, especially one from my kids, I thinly sliced a bunch of kosher dills and started assembling the sandwich. Well, my munchkins are definitely on to something. 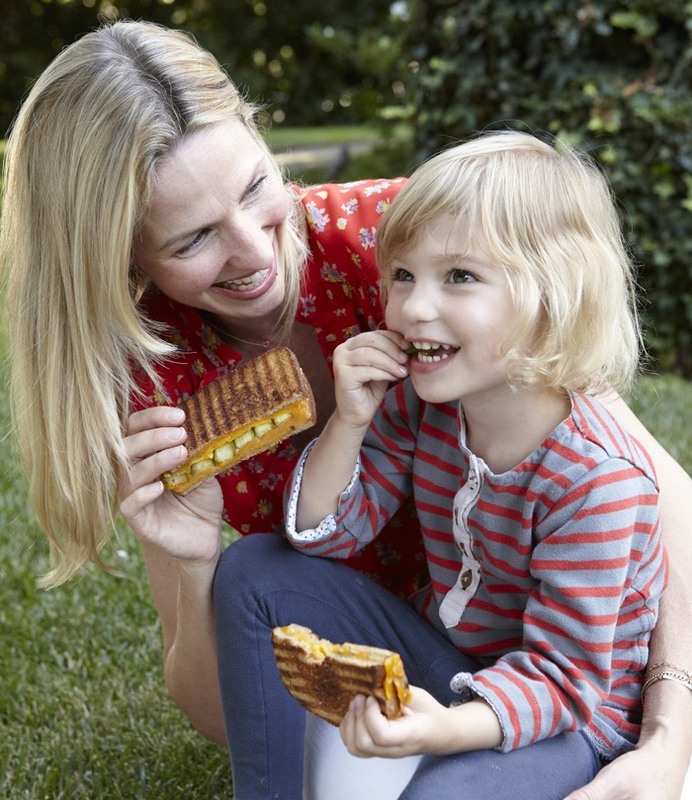 Who knew you could up the ante on the classic grilled cheese -- a sandwich already bordering on perfection -- but three days in a row later, the Grilled Cheese and Pickle Panini has become a new lunchtime favorite in our house. 1. Preheat panini maker (this can also be made in a saute pan). 2. Place a slice of cheese on one slice of bread and cover with a layer of sliced pickles. 3. Place another slice of cheese on top of the pickles and cover with a slice of bread. 4. Continue making the second panini. 5. Place sammies in the panini maker and cook for 2-3 minutes. 6. 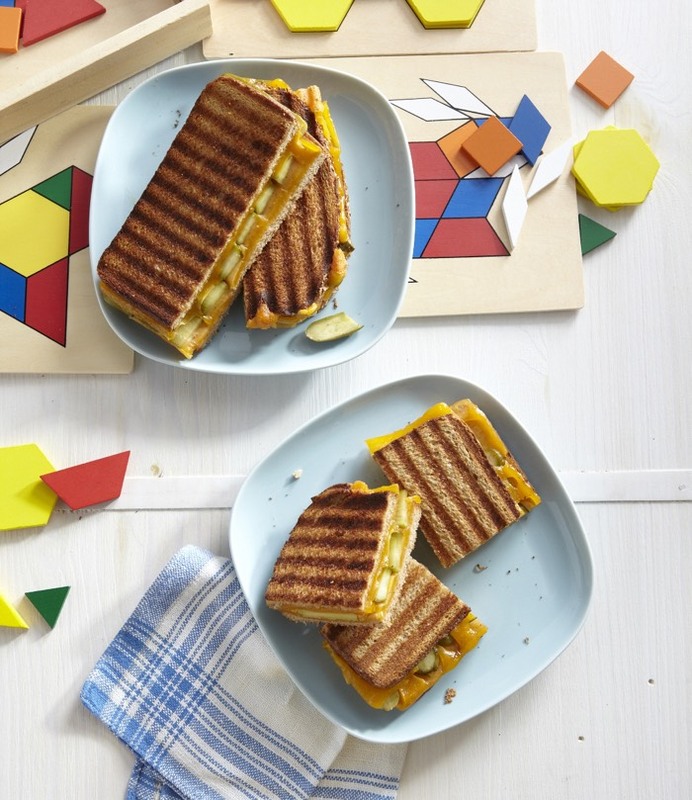 Slice panini in half or on a diagonal to make triangles and serve. When my nieces were little this is the only way their mom could get them to eat something remotely healthy! Luckily my daughter isn't as picky as they were but she loves pickles. Can't wait to make it for her! Yum! I love pickles and cheese so this would be great! My 3 yr-old daughter is going to love this! Her two favorite foods are grilled cheese &amp; pickles by themselves. I think she'll love idea of merging them. :: i've been eating grilled cheese with pickle inside for almost 3 decades! yes. decades! as you know it's pure deliciousness. thanks for your blog. i read every day. while i don't have children of my own, i appreciate your nutritious approach to tasty uncomplicated foods. cheers! Myself and my two and a half year old eat pickles and chees on whole wheat with brown mustard all of the time. Would not be so far featched to grill it. Sometimes we put it in the microwave to melt the cheese a little. you get melty cheese without having to use the butter to grill it. I have been eating this for years. My grand mom showed me when I was a little girl. \"MMMmmmMMM\" said my 17mo with her mouth full of cheesy-pickly goodness. Thats so funny! =) my niece has been eating these for a while and when i was pregnant she got me hooked! i haven't had one since i had my daughter but i think it will have to make a comeback =) thanku! Branston pickle and cheddar sandwiches is a well-known delicacy in England. Next time you're in NY, try the version at Tea &amp; Sympathy. Delicious! I'm so glad that I'm not the only one that actually have been eating this...I even made a special request grilled cheese with pickles at a local diner when I was pregnant..Now, when I do that, I only get the \"weirdo\" look from the waitress. Good thinking, Kenya! We always serve grilled cheese with pickles on the side at our house! Never thought to put them IN the sandwich! Can't wait to try it out! So funny my daughter asks for \"pickle sandwiches\" all the time! When I was a kid my dad used to make grilled cheese with mustard and a sprinkle of oregano on them. YUMMY! Mmmm, i've been eating grilled cheese and pickle sandwiches for years. Something about the combination of creamy cheese and the crunch of the pickle make it perfect!! These pickle and cheese masterpieces taste good with a little ham, or bacon inside as well. :) I too have been eating pickles and grilled cheeese sandwiches together since childhood and love the combo. You other ladies that enjoy this from the north at all? holy moly! i thot my daughter was the only kid around who loves pickles!! just made this concoction for her recently - except she doesnt even need it grilled. just a slice of cheese (not necessarily cheddar - usually monterey jack by request), and pickles between two slices of plain old whole wheat bread! interesting what kids come up with when their imaginations aren't restricted! :: shannon :: i use dill when i make mine. I am going to try this right now with some fridge pickles I made; I cannot wait! How does your mind keep going with new stuff? Well at least your son came up with this one. Any suggestions on a particular brand of panini maker that's small and does the job? We live in an apartment and don't have much counter space for the nicer, large ones. One of my faves is grilled cheese with pickle AND tomato! I just made this on my little george foreman grill. worked great. When I make grilled cheese sandwiches, I MUST have a side dish of hamburger dills!!! I can't even imagine a grilled cheese without the pickles. Yum, Yum! We grew up on hamburger dills in our grilled cheese! I am sitting at work, drooling over this. When I was younger we did cheese and pickle with tortillas instead of bread. Hadn't had for years till I was pregnant with my son, and then it was one of my weekly/daily cravings. I am already craving certain foods in early pregnancy and have a feeling that grilled cheese and pickles is going to be on the list! In fact, I think I already know what I'm making for lunch tomorrow :) And the bonus is that I'm sure my 2 year old will love it as well! Thank you!! My Daughter loves pickles and I cannot wait to try this for her. As another suggestion this Kentucky girl grew up putting slices of ripe tomato on my grilled cheese, it makes a great summer twist on this classic sandwich too!!! I've been eating these sandwiched for nearly 6 decades - sometimes I add tomato. Wow - brings back memories and an intense urge to eat a sandwich I haven't had since I was a kid. A little different - but my Mom used to make an opened faced toasted cheese with muenster cheese, mustard, and four dill pickle chips. I remember when a college friend of mine suggested this. I thought he was crazy, but then...WOW. I've got a salt tooth too. Caramel is only really alanppieg to me with a good kick of sea salt over the top. And I think these would be just the thing to perk up some scallops on a sweet corn puree. Nb, have just found your blog and have spent the best part of an hour swooning. Thank you for the escapism! Ive been eating grilled cheese with pickles for years! My mother would make them when I was younger. Delicious! Is this the kind of thing you would pack in a lunch? And if so, how? With a cold pack? At room temp? Thanks! I have packed this in lunch many times! Make the sandwich and allow it to cool before packing it in lunch so it doesn't get soggy! I always pack an ice pack with lunch to make sure everything stays at a safe temperature by lunch time! Lunch is not reheated, so it is served at room temp! I introduced this dish to the food service staff of Tulane University in 1958. We used readily available stuff, Kraft cheese, dill pickle chips (for hamburgers)., butter for frying. Now, I use \"sandwich stuffers\" or \"pickle planks\", precut, on Potato Bread, and EV Olive Oil instead of butter.. Cooked on one of the newer \"green-pans\", it's quick, easy, and cheap. To gild the lily, make one more layer, with fried uncured bacon strips. Hey, Hey, USA, where the so-called \"junk food\" is world class! Wonderful stuff, and right up there with the Reuben! FWIW: These make piquant \"funeral sandwiches\" too.... Heavenly sandwiches served with Deviled Eggs. Also special is peanut butter, dill pickle, and grilled cheese. I really appreciate this recipe and for one think the pickles make an awesome and unique twist. I wonder if you have ever trying using another type of cheese, like brie? Classic cheddar cheese grilled cheese are amazing, but I find brie to be a fun change of pace.